There is an excellent field recording of the Worcester concert in November 1999, where Bob Dylan (on the same ticket as Phil Lesh) opened with this short but impressive song. In the pause before the next song you hear one member of the audience say to another the simple words: "Try doing that to a deadhead!" Well, only Bob Dylan would, and on the second "Preaching-to-the-deadheads-Tour" in 2000 Bob did it again, four times. The Berlin performance of "SOMEBODY TOUCHED ME" on the night before his 59th birthday was the only performance outside the US until September 2000, when Bob performed it on consecutive Sundays in Glasgow and Portsmouth. My wife Catina and I were doubly delighted to be present at both shows, as on both occasions Bob used this song to open an exceptionally great show. The Portsmouth version, which is as good as it gets, appeared as the opening track of the officially released Japanese album "Bob Dylan Live 1961-2000 ~ Thirty-nine years of great concert performances", which was sold also in European record stores. One Japanese audience in Nagoya got to hear this great opener in 2001, and another US audience in Nebraska, before Bob Dylan chose to perform it twice in Italy, in Perugia and in Taormina. 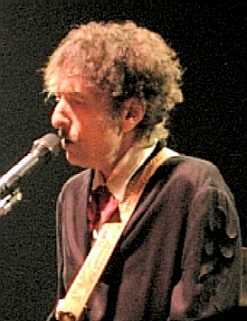 A few weeks later "SOMEBODY TOUCHED ME" was performed in Wichita; and another week later he sang it in Sun City West, where for the fifth time Bob Dylan chose to include "GOTTA SERVE SOMEBODY" within a setlist starting with "SOMEBODY TOUCHED ME", as he did already in Perugia, in Portsmouth, in Reno, and in Berlin. During the fall 2001 tour this bold confession opened two consecutive shows in Syracuse and Morgantown. Then this song took a rest for nine months until August 2002, when Bob Dylan chose to open his sixth Canadian show in Ottawa with "SOMEBODY TOUCHED ME". Thirteen days later, in Saskatoon, Bob opened another Canadian show with it, during which he also performed "THIS WORLD CAN'T STAND LONG", followed by "SOLID ROCK". Two days later "SOMEBODY TOUCHED ME" opened the show in Calgary. Something about this hand though. "By his hand I've been delivered" Bob said after he was "SAVED" and still it is the hand that touches him while he is praying or while it was Sunday (maybe while he is reading his bible). Sometimes he doesn't "even hear a murmur of a prayer", as well as he must confess that "sometimes I turn there's someone there, other times it's only me". He knows that it is not up to the believer but up to God to bless and heal with the touch of his hand. But this hand nevertheless keeps and sustains the singer, for Bob Dylan still "can see his Masters hand in every leaf that trembles, in every grain of sand". He is certain that the same hand that led him through seas most severe will kindly assist him home. This hand Bob Dylan sings about is the only hand that imparts lasting glory, it is the nail-scarred hand of his wonderful Savior and risen Lord that will "lead you beyond the burning sand", if you only would "let him take you by the hand". The Lord is my strength and my song; he has become my salvation. Glad songs of salvation are in the tents of the righteous: "The right hand of the Lord does valiantly, the right hand of the Lord exalts, the right hand of the Lord does valiantly!"